Imagine dining alfresco beside the man or woman who grew and hand-harvested the delightful fruits and vegetables on your plate, the person who personally raised the beef or lamb, or line-caught the fish, and the winemaker who crafted that fine glass of wine you’re sipping. Joining them for an extraordinary dinner party on the farm is an idea that’s quite appealing. Besides the joy of being amid likeminded food and wine lovers, it’s an amazing celebration of life and a salute to the stars of the earth who provide nourishment for our bodies and our souls. 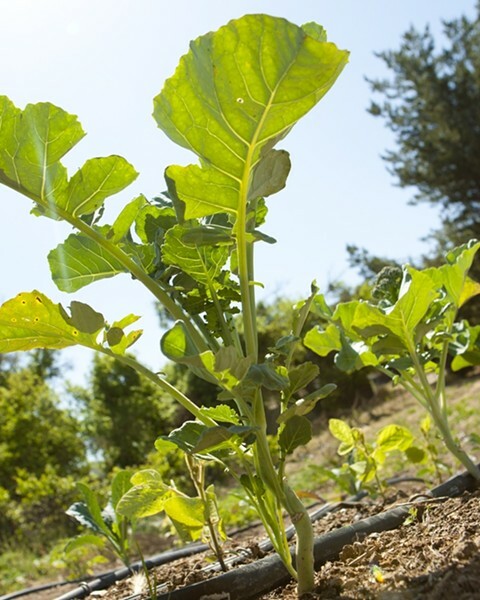 GINORMUS : Broccoli on the small Kobayashi farm grows taller than trees—but only when the camera is on the ground. Doesn’t the thought of it alone make you hungry? You’ll have a chance to join one of these amazing farm dinners in May, June, and November now that Outstanding in the Field (OITF) is returning to the Central Coast. Five of these dinners that combine chefs, farmers, winemakers, and/or brew-masters at local farms are scheduled to take place: in Santa Barbara, Solvang, Lompoc, Cayucos, and Santa Margarita. At the latter, tickets are still available for one of my favorite local chefs, Chris Kobayashi of Artisan restaurant in Paso Robles. Hosted by Rinconada Dairy, Chris will be joined by winemaker Neil Collins of Tablas Creek Vineyard, who’s also bringing his Lone Madrone Bristols Cider to pair with appetizers. Rinconada Dairy’s excellent handcrafted cheeses will be part of the meal, among other foods grown and raised in the area. The OITF event is the creation of artist and chef Jim Denevan, who builds “restaurants without walls” across the nation. According to the company’s press release: “Wherever the location, the mission is the same: to reconnect diners to the land and the origins of their food and introduce them to local farmers and food artisans whose good work brings nourishment to the table.” The ingredients for the meal are typically sourced from the farm and sometimes their neighboring farms, and prepared by the area’s most notable chefs. The website, outstandinginthefield.com, has the full list of upcoming farm dinners, beautiful photography showcasing past events, and allows you to purchase tickets, which cost around $200 per guest (local taxes apply). Tickets for the aforementioned event on June 7 are on sale at outstandinginthefield.com (please note: you cannot make reservations through Artisan). It’s become almost customary for restaurants to credit the farmers who supply the foods you’ll find on their menus, as does chef Chris at Artisan. Owned and operated by chef Chris and Shandi Kobayashi and Mike and Tina Kobayashi, the brothers and their wives go a step further by prominently posting the names of local farmers in Artisan’s dining room. This family has taken on yet another new task to improve their guests’ dining experience at Artisan: Last fall they gained access to a garden that they are farming sustainably to supply their larders (of course, they’ll still support the farmers as they always have). Located in Templeton, it’s within Jenny Siebenthaler’s 5 Dogs Farm, which is sustainably grown. “Jenny had an extra section of dirt, so she invited us to farm it,” Shandi explained. “We have four rows that are three feet wide, by about 120 feet long, in which we’ve planted tomatoes, pole beans, peas, kale, broccolini, Swiss chard, and lettuce. “The bugs are having a feast,” she added, laughing. INSPECTION : Chris and Shandi Kobayashi inspect their small four-row farm that actually produces more vegetables than their restaurant Artisan can use. The project has become so popular, Artisan’s staff drives out there to help weed and harvest produce. Through the annual event, OITF, the Kobayashis present culinary adventures at various Central Coast farms and wineries. To help guests better appreciate the farm experience, the multi-course feast is usually presented alfresco among the lush green grapevines, or near the field that yielded the sugar snap peas and lettuces you’re enjoying. This is fine dining at its best, surrounded by nature. Now in its fourth year of producing this amazing feast in the great outdoors, chef Kobayashi will be cooking at Rinconada Dairy for the second time. Last year they had inclement weather challenges and were forced to set the long table under the tent. Fortunately, the showers passed by the time the guests finished the Rinconada ranch tour. They pulled the tables back outside so guests could dine under the warm sun. Christine and Jim Maguire, owners of Rinconada Dairy, have farmed organically for 25 years in North County, from breeding and raising sheep to milking them and making cheese. Christine, who makes their various styles of cheese at the ranch, is a graduate of the Natural Gourmet Institute in New York City. Their 52-acre ranch features a sprawling garden with hen houses and organic fruit and vegetable gardens. The Kobayashis will also bring in other farmers they support: Debbie Paver of Charter Oak Style Meats in Templeton; Stephanie Simonin of Happy Acres Family Farm; and Bill Spencer of the renowned Windrose Farm in Paso Robles. The OITF crew stages the event with chef Chris designating the kitchen set-up. The chef can do some prep ahead in Artisan’s kitchen, but all of the finishing is done on site the day of the dinner. Chris also takes along some of his cooking team to help prepare the OITF dinner since they serve anywhere from 100 to 120 guests. Although the OITF dinner is too pricey for everyone, there are many events that happen annually at Artisan that are downright reasonable, like snack bar Wednesdays that run April through June.